no division between military and civilian participation." The list is combined with Creative Commons footage from Gaza released onto the web by Al Jazeera. The Al Jazeera TV channel continues to update their Creative Commons page with more recent footage from Gaza. It was projected onto the exterior of the Israeli embassy in Dublin on the evening of the 19th of January as a response to a 'PR attack' on Ireland by an Israeli Minister fresh over here from overseeing the slaughter in Gaza. Those involved in the collection of signatories, the action at the Israeli embassy, and the production of the video would appreciate any efforts made by others who support this action to spread this video through their blogs, websites and online social networks. We, the undersigned, are united in seeking the immediate expulsion of the Israeli ambassador to Ireland, Dr Zion Evrony. We believe the ambassador must leave Ireland until such time as there is a complete end to Israel's war on Gaza and its continued slaughter of the Palestinian people. 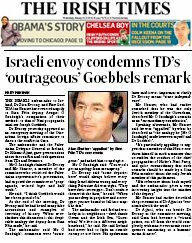 Alan Shatter's Methods Like "that Of Nazi Propaganda Minister"
The Irish Times in a front page article expose their total lack of journalistic focus. One of the problems with the media today is their tendency to focus on scandals as opposed to analysing the spin coming from the political establishment. Instead of offering the public a critical eye of the spin, the media likes to focus on ‘big scandals’ as that’s what ‘sells papers’. The desire to focus on a scandal often means that the substantive issue that should have been focused on gets ignored in the tabloid style moral outrage. Wednesday last, 14th January, in a front page article by Mary Minihan we were exposed to a crass example of the problem I have expressed. 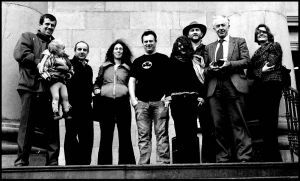 Read The Irish Times article here. During the Israeli ambassador's visit to the Dáil, at an emergency meeting of the Oireachtas Foreign Affairs Committee to discuss the conflict in Gaza, Aengus Ó Snodaigh (Sinn Féin TD) attacked the ambassador and resident Zionist Alan Shatter, Fine Gael TD. It seems that Aengus, unhappy with the spin that the two were bringing into the debate compared their methods to “that of Nazi propaganda minister Joseph Goebbels.” Aengus was unhappy with their attempts to expose the Oireachtas committee to “propaganda, twisted logic and half truths”. We have taken this action in an effort to prevent or delay war crimes being committed by the Israeli Defence Forces in Gaza with the use of Raytheon weapons and to try to force a criminal investigation into the activities of the Raytheon company in Derry and elsewhere which, we believe, amount to complicity in war crimes. Like millions of others, we have watched television pictures of innocent people being slaughtered since the Israeli assault on Gaza began on December 27th, and have wanted it to stop. But nobody with the power to make it stop seems willing to intervene to do so. Lawyers and international human rights organisations have declared that the Israeli bombing and shelling of Gaza involves war crimes. The bombing of a UN-sponsored school on January 6th, killing at least 40 civilians, including children, has merely been the worst of these war crimes. Raytheon is one of Israel’s main suppliers of the weapons being used in the attacks on Gaza. The company is either aware or doesn’t care that its weapons are being used to commit war crimes. 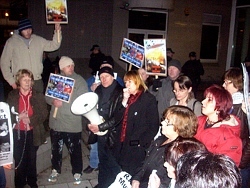 Shannonwatch.org, a website set up in December 2008 to document US military traffic and rendition flights through Shannon Airport has become the victim of organised international attacks. The attacks which started on January 8th are being repeated, and efforts to keep the website live are currently proving difficult. The website managers are determined that they will not be silenced however, and will continue in one form or another to publish information on military and suspect CIA flights through Shannon. • ShannonWatch asks Is Ireland facilitating possible genocide at Shannon? More than two years have passed since these two cases began. On Thursday last, Conor was at a special sitting of Ennis District Court for the finale.